Paul Blakemore at his home base — Concord Music Group’s mastering studio in Cleveland, Ohio. We often overlook the importance of good mastering. While advances in hardware and software technology have brought previously unattainable gear within reach, most still recognize the importance that an &apos;outside ear&apos; in a properly designed room can bring. 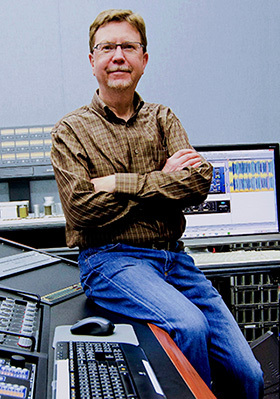 Though mastering engineer Paul Blakemore humbly credits Bob Ludwig, Doug Sax, and Al Schmitt as his role models, his experienced ear for solving mastering "puzzles" has earned him multiple Grammys for his work on recordings for singer Esperanza Spalding and latin jazz artist Arturo Sandoval. Marsha Vdovin learns how he got into the mastering game, how UAD Precision Mastering plug-ins are instrumental to his workflow, and what keeps it fun after nearly 40 years in the studio. Maybe you can start with a bit of background on your journey to becoming a multiple Grammy-winning mastering engineer? I started out as a musician. I went to music school at University of Texas at Austin back in the early ‘70s, but I had always been seriously interested in recording ever since I was a small child. In 1958 when I was four years old, my dad bought a tape recorder, which had just become a common consumer product. Even as a small child I was completely captivated by the whole notion of it and I was already really interested in music. So I pursued music, but it became clear to me that I was really a lot more interested in recording it rather than in trying to be a performer. In 1975 there really weren’t any degree programs around in recording engineering, but at the Eastman School of Music in Rochester, New York, they had summer school that was taught by a professional faculty of serious recording engineers: Don Puluse from Columbia Records, Val Valentin from Verve, Ed Greene from Hollywood, Neil Muncy, who was an electronics and acoustical designer, and others. I went to that school in the summers of ’75 and ’76 and got a really good background. And then, I got really lucky and landed a full-time job, which led to another full-time job. By the time I was 24, I was a really active recording engineer. I was on staff at National Public Radio in Washington, DC, where I was one of the main recording engineers for a jazz series called “Jazz Alive,” featuring live jazz recordings from all over the world. In the early ‘90s I was becoming increasingly interested in mastering, because CDs were really taking hold and the whole CD mastering thing was a growth industry. I got into mastering around ’93 and have been doing it ever since. It seems my skill set and personality were well-suited for the job. I have an aptitude for the kinds of puzzles you have to solve in mastering. I think recording engineers have to be a lot more extroverted, because they’re dealing with a lot of people, a lot of big egos. Their job is really as much a psychologist as a recording engineer — you really have to deal with people. I’m a more quiet person. I’m more interested in listening, solving problems, and fixing puzzles. So, I was just ideally suited for mastering. I also had both the technical aptitude — having been a career engineer for about 20 years by the time I got into mastering — and the musical background. I really think that to be an effective mastering engineer you have to be, if not a musician, extremely knowledgeable about musical styles. As a recording engineer, I didn’t do a lot of pop music. I was primarily involved with acoustic/instrument music, so I did a lot of jazz and blues. I also worked on bluegrass and folk projects, as well as a lot of classical music. How long have you been involved with Concord Music Group? I originally started with Telarc (an independent classical recording company) in 2000 as a post-production specialist, not as a recording engineer. I did mastering and music editing and a number of other post-production-related things. Then around 2005, Telarc was sold to Concord Music Group and they basically jettisoned most of Telarc. Telarc had been a classical, jazz and blues label that was primarily known for being an audiophile label. For a number of different reasons, I was the only person from the old Telarc staff production department who was kept on when Concord reorganized. It may have been heavily influenced by the fact that I had a lot of mastering experience and they didn’t have a staff mastering engineer at the time. Since that time, they’ve bought yet another independent label, Rounder Records. I now do about 60 percent of the mastering for nine different active labels. I generally do 120 to 130 projects a year, every year. It’s been really busy. That’s an amazing amount of mastering work, especially in this new industry climate. It’s incredible. What’s happened for me, personally, is that this has morphed into my dream job. I’m working with a lot of different producers, a lot of different artists, and I’m working in a really wide range of musical styles, which I really thrive on. My whole musical taste is really quite enormous. I embrace all of music and have spent a lot of time studying a lot of different styles of music and a lot of different mastering and production styles. It’s great for me to get to work one day on a straight-ahead jazz record, the next day on a Stax R&B record, the next day a Rounder bluegrass record, and then on to a Concord standard pop record with a singer and a studio orchestra. It’s everything imaginable. I’m also really fascinated by audio restoration. Concord Music Group has something like 10,000 titles in their back catalog. They own the catalogue of Milestone, Prestige, Fantasy, Stax, Rounder, Telarc, Heads Up — I can’t even remember all the catalogs that they own — and they’re constantly in the process of repurposing and re-releasing a lot of this classic material. So there’s also a huge amount of catalog work that involves audio restoration. How does mastering jazz differ from other genres, such as rock, pop, and classical? They’re all very different styles. Jazz, for example, is sort of in between classical and rock. It needs some kind of dynamic range control, but not really aggressive, whereas rock wants much more aggressive dynamic range control to simulate the live, loud-band listening experience. In classical, there’s little (if any) dynamic range control, because one of the key aspects of expression in classical music is the dynamic contrast. The differences between the soft passages and the loud passages play a very important musical function, so you want to maintain those in classical mastering. You also want to optimize the music for whatever the delivery format is. In jazz you do some dynamic range restriction, but it’s a wider dynamic range than rock. Rock generally has a much more constricted dynamic range. So you generally aim to keep most jazz fairly open, with its natural dynamics? Exactly. It also depends on the style of jazz. There are certain kinds of jazz fusion that I do a lot of, because there are a couple of different labels in the label group that do a lot of this sort of contemporary jazz that’s kind of a fusion of pop and rock with jazz. Stylistically, those generally want a greater amount of dynamic range control and a louder overall presentation than a straight-ahead jazz album. But it also depends on the artist, and on the instrumentation. Some of the artists want a more aggressive dynamic range control than others. Some of them want things to really be fairly wide open dynamically. Every project has its own set of puzzles. Do you use a K-weighting scale? No, I don’t. I have my own sort of targets for average volume and how the peaks behave. And depending on the style of music I’m working on, I go for one of those target ranges. All the metering I have in my studio, all the digital metering, displays both average RMS level and peak level. The metering, though, is just in service to what you’re hearing. So ultimately it’s all done by ear. You just have to use the metering to make sure that you’re within the technical limitations of the delivery medium. But things like determining relative volumes between songs — all that stuff’s done completely by ear. It always amazes me that increments as small as tenths of a dB are clearly noticeable when determining relative volumes. Can you describe your studio setup? I imagine you use some mastering-specific gear. A couple of years ago we moved the studios to a different location, and Concord built me a really wonderful new mastering facility. It’s a very large mastering room. The hard ceiling, which is what the low frequencies essentially see as their boundary, is 16 feet tall. There’s a soft ceiling at 12 feet that’s absorptive and that’s used both for high-frequency control and for low-frequency absorption. The walls are all treated with a combination of RPG and Kinetics acoustical products to give a particular reverb time and a particular kind of diffusion characteristic in the room. The room was designed by a Chicago acoustician named Dana Kierkegaard. There’s also a significant amount of low frequency absorption, especially in the front of the room behind the loudspeaker positions. When you walk into the room, you see room boundaries that are much smaller than the actual size of the room because there’s so much acoustical treatment permanently built in. As far as gear, I master in a German-made workstation from Magix called Sequoia that is commonly used in mastering applications. Its user interface is particularly well suited for mastering. It’s unbelievably flexible and very fast to use in the kinds of minute, correctional adjustments that you have to make in mastering. The hub of the studio is a Crookwood mastering console. I love the Crookwood because it is so transparent sonically. I used to have a bunch of different kinds of converters, but over the years of doing a lot of testing and listening, I have narrowed that down. I mainly use EMM Labs, which are made by Ed Meitner up in Canada. I use his Mark IV converters, or I use the Digital Audio Denmark model AX-24. As far as outboard signal processing, I mostly rely on the Sontec Mastering MES 462 for EQ. Then for dynamic range control, I have the Pendulum Audio PL-2 and Crane Song STC-8 analog limiters that I really like. Then, of course, I have my UAD Powered Plug-Ins running as VST plug-ins within Sequoia. Maybe you could describe how you’ve used the UAD Powered Plug-Ins on some of your classic re-issue projects. Sure. There was the classic Albert King album, Born Under A Bad Sign, which was recorded in the late ‘60s in Memphis at the Stax studio. All the sidemen on that record were the members of Booker T & the MGs and Isaac Hayes. It was an amazing band. It was all recorded on ½” 4-track. I have one of Mike Spitz’s ATR Services rebuilt Ampex ATR-104s, with the new Flux Magnetics heads, which are amazing and extremely flat. So, the transfers from the ½” 4-track analog were done with the ATR-104 at 96kHz/24bit. The tapes were actually in really great shape, because they predate the ‘sticky shed syndrome’. They didn’t require any baking. The tracks sounded amazing. When you give me one of these restoration projects, I’m such a nerd. Handling these tapes is like handling holy relics to me. Just to look at them. Actually, all the Albert King tapes are sitting behind me right now on a shelf. Paul Blakemore masters countless jazz, bluegrass, country, and classical albums each year, including Grammy-winning albums from Esperanza Spalding and Arturo Sandoval. They’re historical references … It must be fascinating privilege to go through. There are all of these amazing surprises when you open up the tape boxes. Like, I opened up one of the tape boxes, and there were notes about the particular takes that were on the tape that were handwritten on a notepad that was printed “From the desk of Steve Cropper,” the amazing guitarist who played on all those incredible Stax sessions. Sometimes the tape boxes are so interesting to me, the doodles on them, or the notes or whatever, I actually scan them and store PDFs of them on my computer just as keepsakes! Unfortunately, there were no track sheets, so first you have to go through and do your audio archaeology and figure out how they recorded it. Now, since these were being re-released along with the original stereo mixes that were done back in the day, the idea was to find unreleased bonus track material, alternate takes, even unreleased songs, and then to mix them so that stylistically they were the same as the original stereo mixes. Right, and the UAD plug-ins were unbelievably useful for doing that kind of thing. For example, there’s a great Albert King song called “Crosscut Saw” that was on the original Born Under a Bad Sign LP. And there were several really good alternate takes. So the producers wanted to use one of those and remix it. I studied the original stereo mixes and tried to mimic exactly what they’d done. And of course you have a lot of limitations about how you can mix when things are recorded 4-track, because they combined instruments on tracks. So you can only pan things in a particular way. On “Crosscut Saw,” the bass and the piano were on the same track. The lead guitar and the horns were on the same track. The vocal was on a track by itself, and the drums were on a track. So, in the original album mixes, they had bass and piano panned hard left, the guitar and horns center, the vocal center and the drums panned hard right. So I mimicked that. The original mixes had what sounded a lot like a mono EMT 140 plate, which would have been a very commonly used reverb system back in the day. Of course the UAD EMT® 140 Classic Plate Reverberator emulation is really great sounding, and it sounds a lot like a real EMT. So that was used in the places where they had used it in the original mixes. On some of the songs they actually recorded the plate reverb to one of the tracks along with some instruments, and then used the plate again in the mixdown on the vocals, since they only had one plate in the studio but wanted to have two different reverbs. Sometimes you’d find things that had like horns and drums on one track, where the horns were printed on the tape with a mono reverb return. And there was another mono reverb on the vocal and the lead guitar. These plug-ins were very useful in recreating those kinds of mix setups. Of course, the classic compressors were extremely useful. The Teletronix® LA-2A Classic Leveler plug-in is used a lot in these remixes. The UAD emulation of the Pultec is really remarkable. It sounds so much like the hardware that it amazes me. When I compared what was coming off of the original analog multitrack tapes to the original stereo mixes from the 1960’s, the mixes had substantially more bass than was actually on the individual tracks. The only way to get that same kind of beefy sound was to use the bottom band on the Pultec Pro EQ. It sounds like you use the UAD pretty regularly? Oh yeah. I mean, I couldn’t live without them. Can you talk a bit about the Esperanza Spalding album that won a Grammy this year? For Esperanza’s previous album, Chamber Music Society, that was the album that she beat Justin Bieber out of the for the Best New Artist Grammy. Basically Joe Ferla’s mixes were so good that all that was required was a little bit of dynamic range control, and for that I used the Precision Limiter Plug-In, which is probably the plug-in that I use the most. It’s incredibly useful because it’s the most transparent digital limiter I’ve ever encountered. It’s really great for doing any kind of music that’s primarily performed on acoustical instruments. You can do big changes to the dynamic range without really altering the timbre of the instruments or the essential character of the mix. On this new album, Radio Music Society, the mastering was more complicated because there were so many different styles of music all on the same album, ranging from funk to big band to delicate ballads. Joe Ferla and Erik Zobler were the mix engineers. In order to get the beginnings and the endings to mesh with the songs that came before and after, some of them required some fairly substantial manual volume adjustment in addition to the Precision Limiter plug-in. You’re kind of remixing the song in a way, because you’re changing the basic dynamics that the mix engineer set up and was performed by the musicians. You have to do this to get the songs to mesh with each other and the whole album to have a flow. But, you do it with graceful gestures so you don’t notice that volumes are being changed. If you need to raise the beginning of a song you can do that, and then if the middle of the song gets really loud, you have to taper the manual volume change so it corresponds with a crescendo in the song to obscure the fact the volume is being changed. That way, it’s not as noticeable when you’re actually turning the volume back down for the louder parts. Another UAD plug-in that I’m really fond of is the Precision Maximizer. You have to use it very carefully because it’s essentially adding harmonics, which makes the music sound louder because there’s more average energy with the addition of harmonics. But it’s really great for adding a little sparkle to a vocal, or making the vocal pop out a little bit; a very subtle use of the Precision Maximizer can do that. For example, on the song Cinnamon Tree, which is the second song on Radio Music Society, the shape is only at 8%, and the mix is only at 31%. But that little bit makes the vocal really shine. Also, the Precision Maximizer has a very different character whether you use it in a single-band or the 3-band mode. In the 3-band mode, the amount of high frequency enhancement is greater than in the single-band mode. So, I’ll audition it both ways and chose the one that sounds best suited for the material. We haven’t talked much about UAD EQ plug-ins. Besides the Pultec Pro EQ — that’s amazing for doing big, sweeping changes — there’re two other UAD EQ’s that I use a lot that are very useful and they do different kinds of things. First there’s the Cambridge EQ, which is like a gigantic tool set — it can be anything. It can do really severe lop-offs of low end or top end or it can do very small amounts of change. It can do a little tiny presence boost and it can do negative EQ to get things to sound less tubby and more bright. It’s really an amazing plug-in and I’m really fond of it. I use a lot of instances of it, sometimes only on a small segment of a song. The other EQ that I really like is the Precision EQ plug-in for doing subtle kinds of timbral things. Those are the three EQs that I use the most. You’ve also won some Latin Grammys. There’s the record that Gregg Field produced and Don Murray recorded. Gregg and Don both mixed it, and I did some final mix tweaks as a part of the mastering. The artist is Arturo Sandoval, and it is a record called Dear Diz (Every Day I Think of You). It’s Arturo’s tribute to his mentor, Dizzy Gillespie. It won Best Engineered in the Latin Grammys this past November, and Gregg, Don, and I share the Grammy for that. It also won Best Latin Jazz album at the Latin Grammys and was nominated for Album of the Year. It also won Best Large Ensemble Jazz Album at the US Grammys this past February. Dear Diz is big-band record with a full 15-piece horn section, rhythm section, occasionally strings, and Hammond B3 organ. Gregg wanted a particular kind of sound — a vintage analog kind of sound. So instead of mixing the whole thing in Pro Tools, they did their mixes and then they divided the tracks up into a number of stereo stems. When adjustments were needed to be made to the stereo stems and in the final mastering — that’s where UAD plug-ins came in. When you do the summing in analog, as we did on this record, balances don’t quite come across the same way as they do if you were just mixing in Pro Tools. So I had to make some adjustments in Gregg and Don’s mixes. I used the Cambridge EQ, the Precision Limiter and either the emulation of the Teletronix® LA-3A Classic Audio Leveler or the Teletronix 1176 Classic Limiter Collection to do some little dynamic range control on various stems. I also used the Precision Maximizer. Not only can it be used subtly to add a lot of sparkle and interest to vocals, it can do the same thing to the horn sections. If you go too far with it, it starts to fundamentally alter the quality of the sound which you don’t really want to do; you just want to add a little hint of it. And the final mastering of the stereo mix was done primarily with the UAD Precision Limiter. You must be so proud of that project. It sounds like you had a good time with it. It was more fun than I can explain! First of all, I’m a big jazz fan. When I was in college in music school, I was the drummer in the number one jazz ensemble at University of Texas. So I really understand the whole big band thing and what it’s really about. I tell you the truth — I’m having the time of my life. I’m 59 years old, I’ve been doing this full time since 1976, and every year gets better. Everyone at Concord Music Group has been fantastic to work with. At this point, the guys that I really admire and that I want to model my career after are the guys who have done it for a really long time. Guys like Al Schmitt, Doug Sax, Bob Ludwig, Bill Schnee, all the great engineers who have decades of experience and are still working. I really admire those guys, and that’s what I really want to do too. I’d like to keep working for another 20 years if possible. Do you produce different masters for different markets? Yeah. Pretty much every project will have at a minimum three different masters. There’ll be a CD master that has the core songs of the record. Then there’ll be a ‘mastered for iTunes’ version, which usually has one or more bonus tracks in addition to the core songs that were on the CD. And as of late there will also be an ‘HD Tracks’ version, which will either be at 88.2 kHz/24 bit, or 96 kHz/24 bit. Most of the work that I do starts as either 96/24 or 88.2/24. Because I do so many projects, I have to be very efficient. I’ll do all the mastering work at the highest resolution and I’ll end up with a essentially a mother file, which is 96 or 88.2, 32-bit floating point. That high-resolution file is used for whatever additional adjustments are needed to produce the standard CD, the ‘Mastered for iTunes’ version, the ‘HD Tracks version’, and often a vinyl version. So, there’re a lot of different masters for each project. How about vinyl records? Do you work in that realm? Yes, recently, in the past couple of years, there’s also been a big resurgence in vinyl releases. I don’t have a lathe here, so I don’t do any lacquer cutting. We send out our lacquer cutting to one of several different people. But I’ve found that you really do have to prepare the audio files that you send to the lacquer mastering engineer, you have to prepare them very differently than you do the CD master. It does add another layer of complexity that’s been a bit of a lost art. I don’t think most younger engineers really have a history with vinyl. There has to be additional high frequency control, otherwise it’s really not going to cut well. While some lacquer engineers will take care of that themselves, I’ve found that others aren’t particularly careful with it. So, I usually try to get the files into a condition that if the lacquer-cutting guy doesn’t do anything, they’ll transfer to the vinyl OK.
And that brings up another UAD plug-in that I use a lot, which is the Precision De-Esser. If you use it in its high pass mode with slow release, it’s a very effective high frequency limiter for preparing digital audio masters for lacquer cutting. I always use it when I’m preparing sound files for lacquer cutting. Also, you really can’t have as much bass on an LP record as you can on digital formats, because it just takes up too much real estate on the surface of the record and makes the grooves too large and violent. The Precision Multiband compressor is really useful for controlling the low end, taming it down to make it more lacquer friendly. I know the goal of mastering is to be transparent, but I think when you pour as much heart and soul into a project as you do, that enthusiasm has to come across on the final product. I really think that there’s this interesting thing that happens in studios, be they recording studios, mixing studios or mastering studios, where somehow what the engineer is feeling about the music gets imprinted in some way on the music. So I think it’s really important as an engineer to open yourself up emotionally and be willing to go wherever it is that the music needs to go. I also think that it’s very important that you be willing to embrace and love whatever musical style that you’re working on because that affection somehow or another ends up coming out of the speakers in some kind of subtle way. Photography by Gary Adams (www.garyadamsphotography.com).